Paprika 2 saves an internal thumbnail of any photo you assign to a recipe, and then saves a link to the original photo in the Camera Roll or Photo Library. This means that if you delete the original photo from the Photo Library you will no longer be able to enlarge the image. If you would like to be able to click on the thumbnail to zoom it, please make sure you keep the larger version around in the Photo Library. Also, we do not currently sync the larger version of the image, so you will only be able to view the enlarged photo on the original device used to set it. 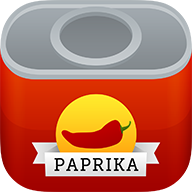 Update: Paprika 3 for iOS and macOS, released in November 2017, now supports storing full-sized photos and syncing them between devices.